If you’re looking for a vaporizer that does it all, you should definitely check out the Arizer Extreme Q. It’s a vape, it’s an aromatherapy device, it’s a high-tech toy, and it’s serious business. Arizer refers to it as their “heavy hitter” and they aren’t kidding. At under $150, the Arizer Extreme Q is an affordable way to get a vape that offers extreme flexibility. That extreme flexibility begins with what’s in the box. In short … it’s a lot. The choice is yours. Fill Balloons with thick vapor, use the Whip System for a direct draw (try using the fan and Whip together for assisted draw) or quickly freshen & set the mood with the Aromatherapy feature. Before we get further into this aspect of the Extreme Q let’s take a high-level look at the general system. The main unit looks a bit like those papier-mache volcanos many of us made when we were kids. It has a large, circular base that sits on four small feet hidden beneath it. These feet are important since there is an opening in the center of the bottom through which air is drawn. At the back of the unit, there is an input for the included AC adapter. At the front, there is a small LCD screen as well as the physical controls. There is a power button, buttons to increase or decrease the temperature, and a menu button. Above them are three indicators showing whether or not the fan, the timer, or the heating process are active. 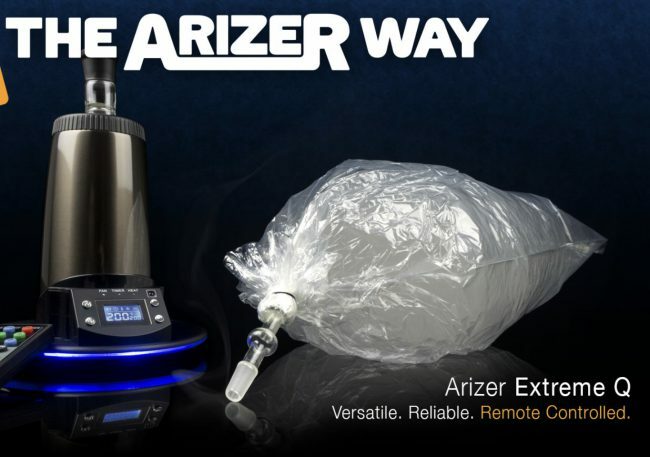 The controls are nice but are actually unnecessary since Arizer includes a fully featured remote with the unit. The remote lets you turn the unit, the light, and the audio indicators on and off. It also lets you set a timer, control the fan speed, and more. Arizer is right to note that “the convenience of the Remote Control quickly makes it a ‘must have’ feature.” In fact, it initially seemed like overkill to have a remote included with a vaporizer but, in practice, it makes using the unit even more convenient than it already is. 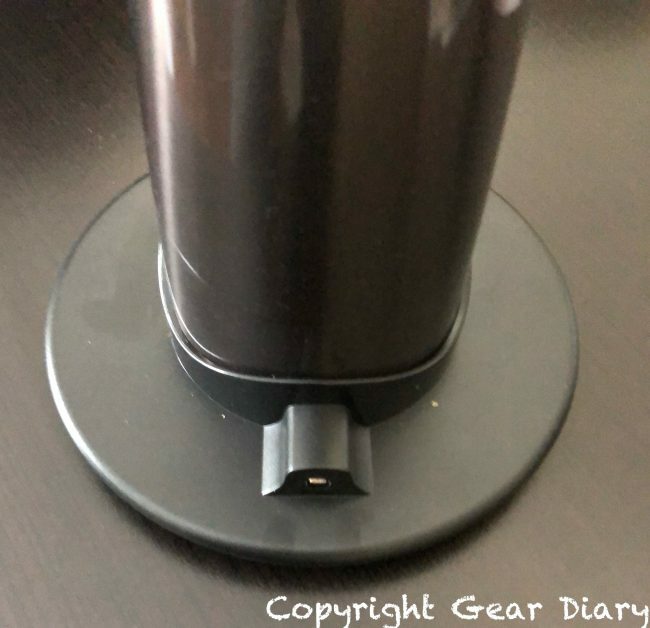 The “tower” or “volcano” is made of metal and has a nice, matte finish that looks classy without trying to call too much attention to itself. The metal construction is important since the Extreme Q offers an extreme degree of control over the temperature. 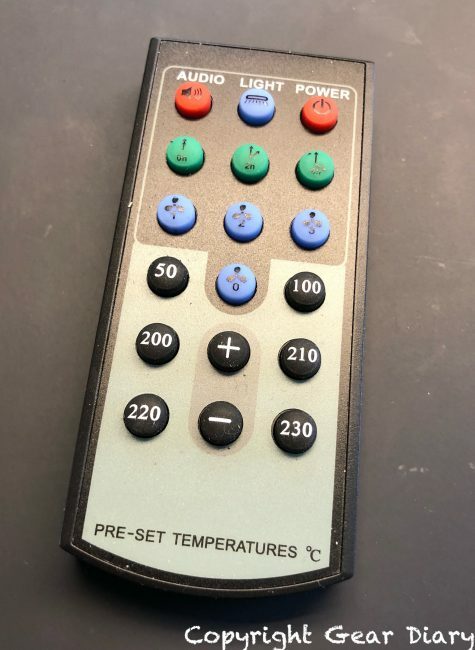 In fact, it can be set to heat from 122 degrees Fahrenheit all the way to 500 degrees with small incremental increases possible using the temperature up and down buttons on either the remote or the unit itself. It heats up in about three minutes. And no matter the temperature, the Extreme Q itself won’t get hot. That’s thanks to dual-wall stainless steel construction. The top of the unit has a plastic ring surrounding an opening that contains the heating element. [It really does look like a small volcano with an opening for the lava at the top.] The various accessories fit into this hole and surround the heating element. 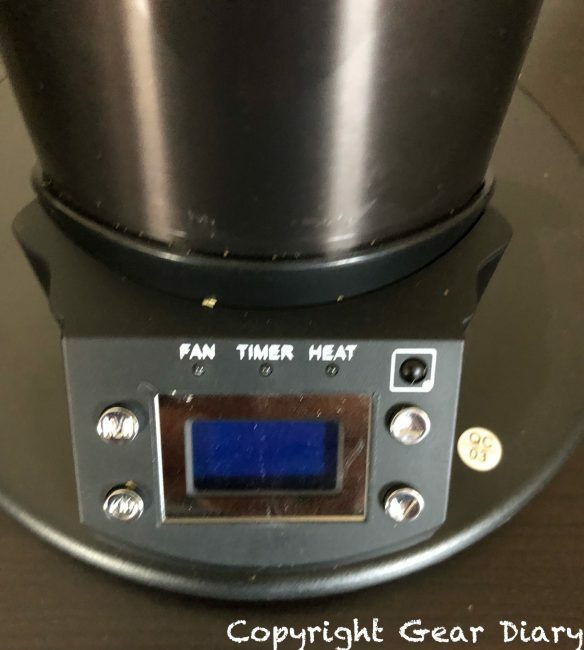 The Extreme Q not only heats the material you are looking to vaporize, but it also includes a fan. That’s important for both the aromatherapy aspect of the device and the balloon options we will explore in a moment. The fan itself offers three different speeds, which can be adjusted using either the control panel on the Extreme Q or the remote control. 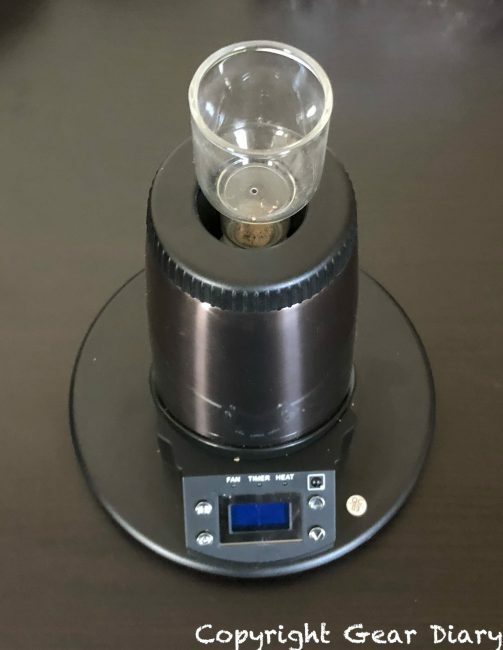 As previously noted, Arizer markets the Extreme Q as a “multi-purpose” device, and there are three main ways to use it. Arizer includes an open glass bowl in the kit. 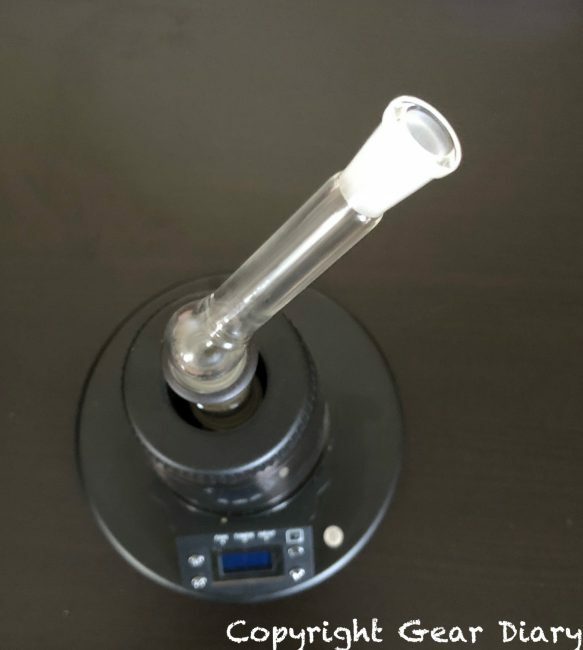 Placing the lower portion of the bowl over the heating element at the top of the unit results in a glass “cup” rising from the top of the Extreme Q. We put some of the included lavender into the open part of the glass bowl (they refer to it as an aromatherapy dish), turned on the unit’s heater and fan, and waited. Within a few minutes, the entire room was filled with the smell of lavender. After adjusting the heat and fan speed we found the “sweet spot” for aromatherapy. It’s lovely! 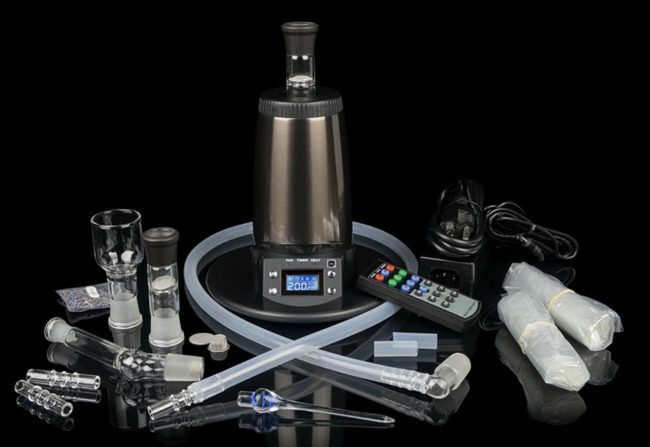 Arizer includes all of the components for those who prefer vaping through a whip. There’s a glass whip mouthpiece that connects to a 3’ silicone tube. The company also includes two glass whip mouthpieces. When using the whip system, you won’t want the fan on, but you will simply use the Extreme Q the way you would any other vaporizer that accepts dry herb of any type. This stationary approach to vaping is the most traditional, and it is ideal if you are sitting with one or two other people. If, however, you are with a larger number of people, or if you want cooler vapor, the next option will be for you. Where the Extreme Q stands out is with the option to balloon vape. The company includes two Extreme Q balloons with frosted glass mouthpieces. 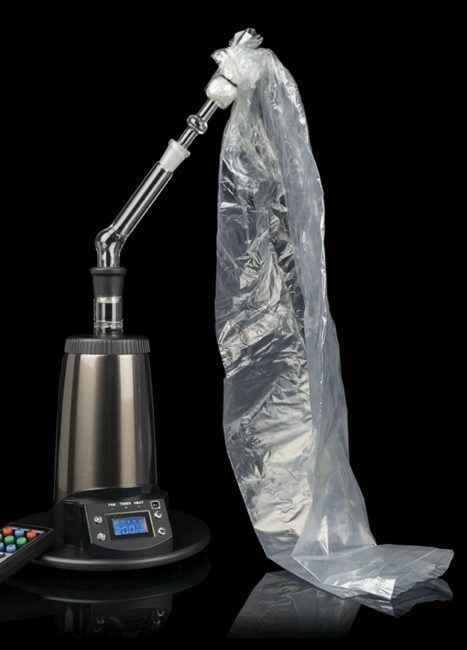 The balloons connect to the glass mouthpiece which is inserted into the mini whip once the dry herbs of your choosing are set in place. After turning on the heating element, the herb will begin to warm. Turning on the fan after a few minutes will begin the process of filling the balloon with vapor. 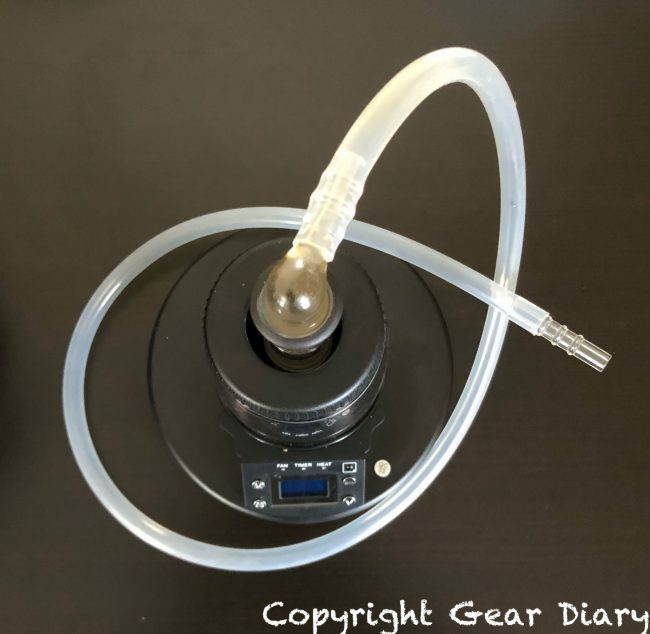 When it is filled to the desired level, you simply turn off the unit, separate the balloon and glass mouthpiece from the unit and inhale from the mouthpiece. The result is thick vapor without the heat that can sometimes burn one’s throat. It takes about two and a half minutes to fill a bag, although your results will vary depending on the fan setting you choose. 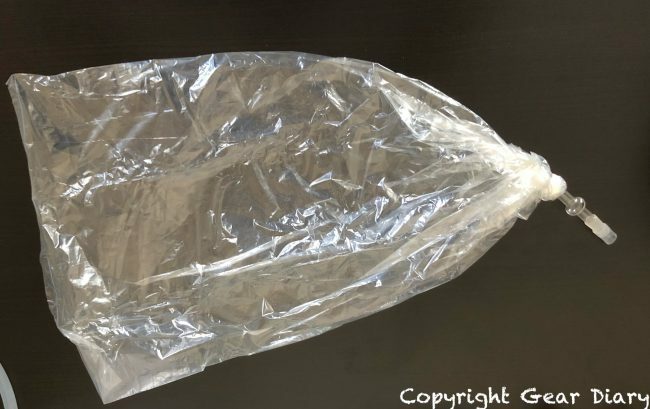 It is worth noting that there’s no valve to keep the vapor inside the bag when it is not being drawn upon. That means you will want to keep a finger over the opening in the glass mouthpiece unless actually drawing vapor from it. So in one unit, you get an aromatherapy machine, a traditional dry herb vaporizer, and a balloon vaporizer. And it all comes in a package that is easy to use and easy to clean up. One might expect a vaporizer of this quality and degree of flexibility to cost a small fortune, but the Arizer Extreme Q is under $200! Arizer notes that this is a new design for the Extreme Q; it is 50% more energy-efficient and 70% quieter when the fan is on. It stays cool thanks to the plastic and metal used in its construction, and the heating element is ceramic. The vapor path is free from plastic, and the accessories are either glass or PVC tubing. 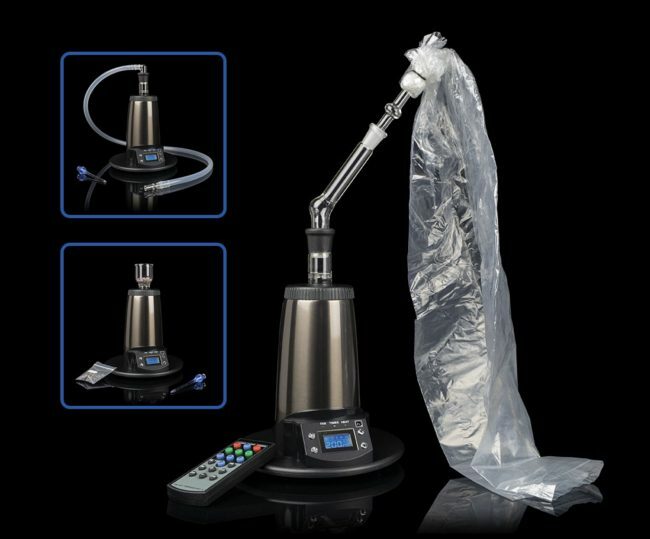 This means the device is comfortable and convenient to use and, much to our pleasure, easy to clean by simply placing all of the various components in alcohol. 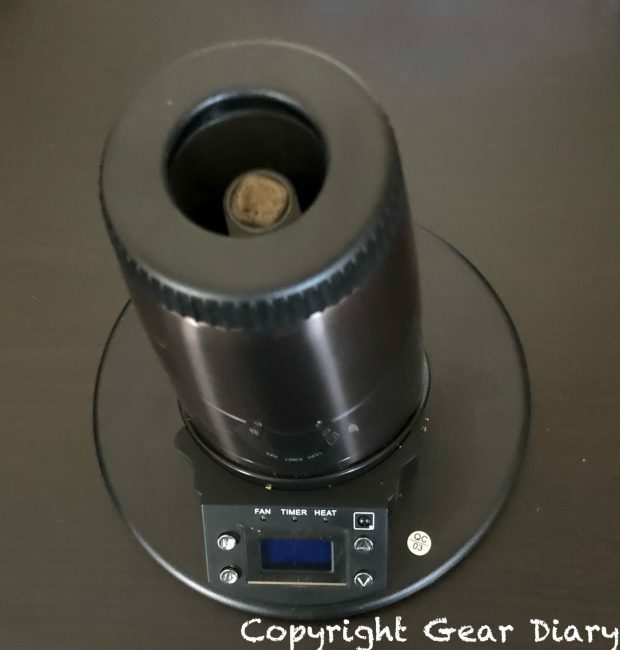 Using the Arizer Extreme Q vaporizer is fairly intuitive but, just in case, let’s do a quick rundown of how to use it. 1. Power on the device. 3. Pack finely ground herb into the bowl and place it on the ceramic heating element making sure the black rubber coating on it is facing up. 4. Let the unit heat up for a few minutes and then set the glass elbow into the top of the bowl. 5b. Attach the balloon to the whip and turn on the fan so it can fill with vapor. 6. 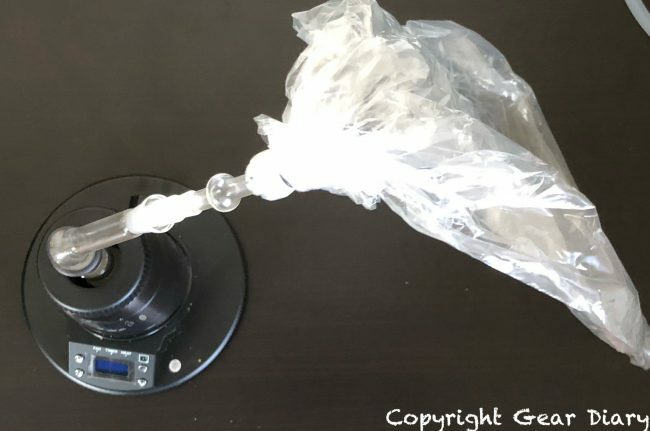 Use the included glass stirrer to mix the herb before refilling the balloon. Be careful. 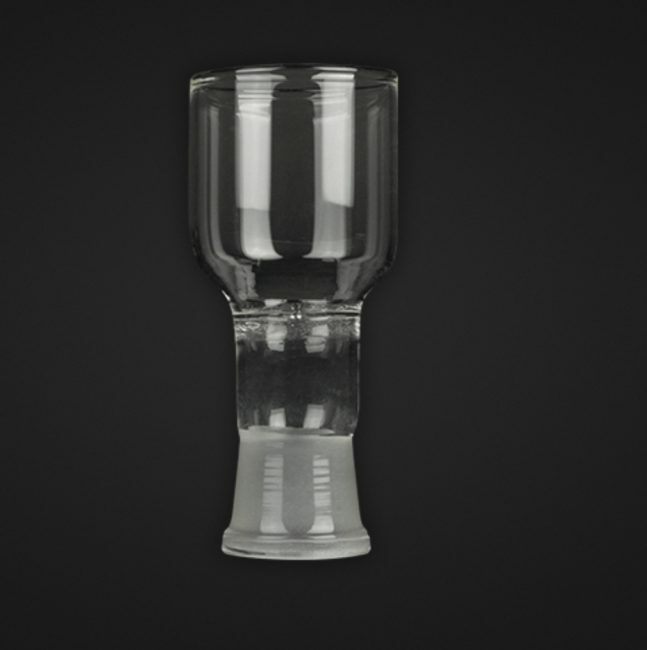 While the unit itself does not get hot, the glass components will. This is especially the case with the glass bowl since it is sitting right over the heating element. There are so many vaporizers from which to choose these days, but the Arizer Extreme Q stands out as one of the best. Its solid build, one-device and remote controls are convenient, it can be used in a variety of ways, and it is reasonably priced. The ease-of-use and simple clean-up round out the “features” making this a simple, reliable and effective vaporizer for those who don’t need something portable. It comes with our highest recommendation and, if you are in the market for a new tabletop vaporizer, we have no doubt you will be as impressed as we are. More details and information on purchasing it can be found here. 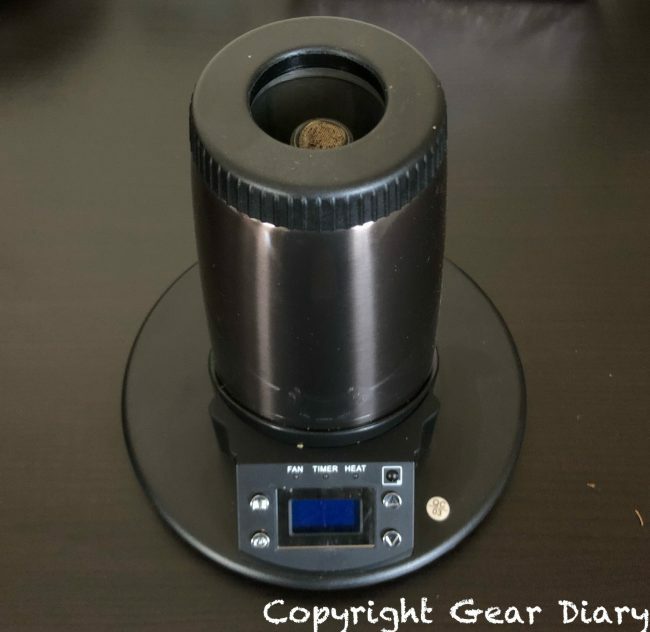 Our thanks to TVAPE for the opportunity to review the Arizer Extreme Q.